The flag could also represent the successful mix of two approaches to firefighting, in this county surrounding the City of Baltimore. As of 2019, 28 volunteer companies spread throughout the county work together with the 25 full-time stations of the Baltimore County Fire Department, concentrated mainly in the area near the city (see a list of stations). 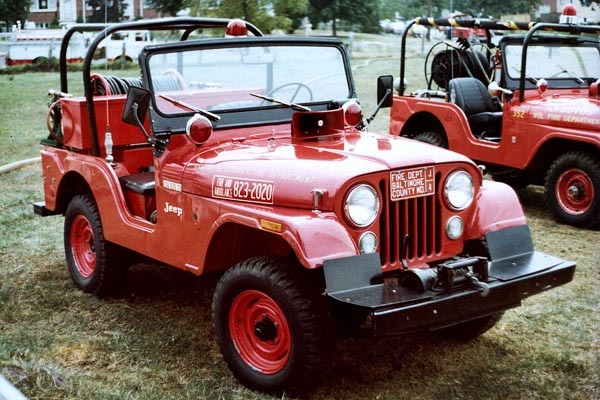 Part 1 of this article surveyed nearly 40 brushfire Jeeps built and operated by the BCoFD from the 1950s to 1990s. 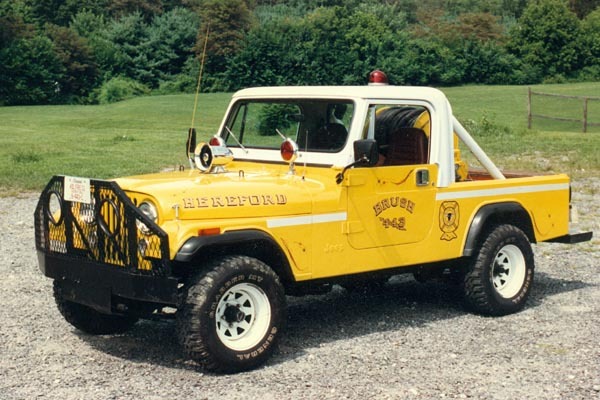 According to former member of the BCoFD and long-time apparatus buff Warren Gleitsman, 21 of the volunteer companies also had one or more Jeeps over the years, although I have not found photos of all of them. 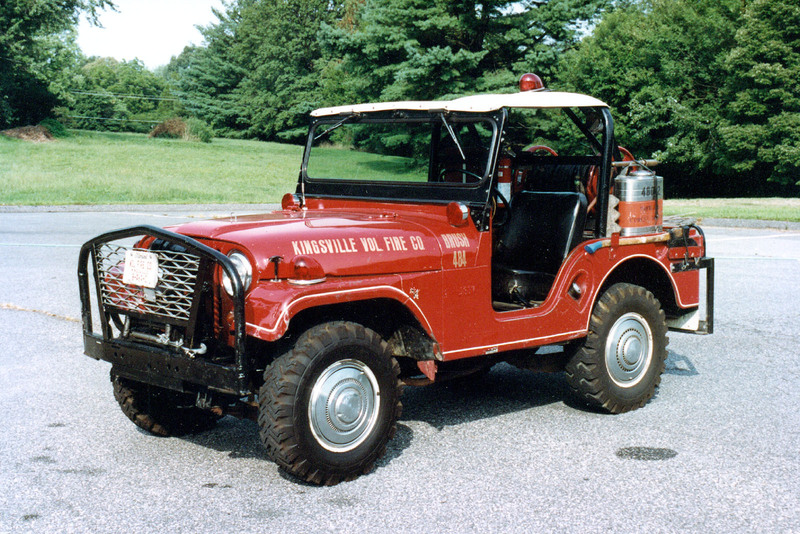 The first fire Jeep in Baltimore County belonged to the Bowley's Quarters Volunteer Fire Department. In the 1940s the waterfront community east of the City of Baltimore, housed many workers from the nearby Lockheed Martin and Bethlehem Steel plants. 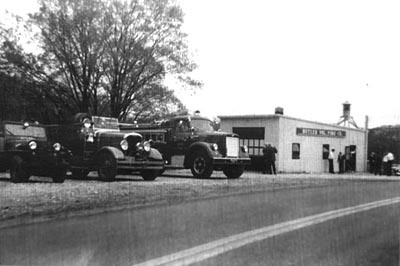 The Fire Department was formed in 1945 (Bowley's Quarters VFD History) and purchased a new Mack pumper and a new Boyer CJ-2A Jeep Fire Engine in 1947, giving them state-of-the-art capability. 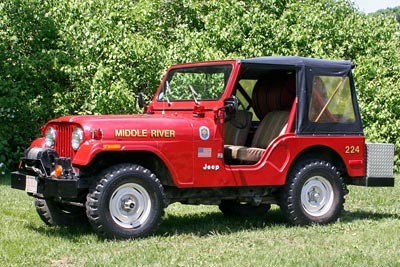 According to the Boyer Production List, Jeep 1 was likely Boyer serial number J-193 and bought from Kerhan Motors in Baltimore. It was lettered for "Bowley's Qtrs. and Vicinity". This great 1947 photo courtesy of the Department, shows members Phil Mueller, Milton Stuart and Charles Forward. The BQVFD Boyer was not typical of later fire Jeeps in Baltimore County, which were mostly locally-converted brushfire units. But it does appear to have been the first, so it may have helped inspire the trend across the county. 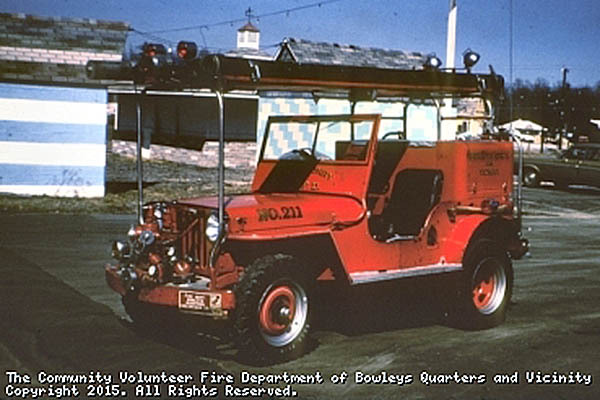 After Bowley's Quarters became Station 21 in the county system, they gave Engine 211 dual rear wheels. 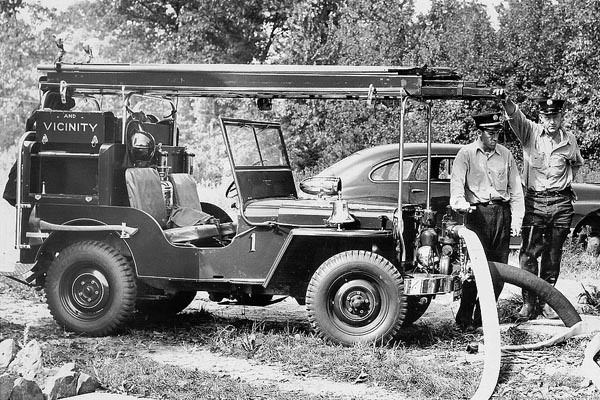 This was a smart modification to improve the ride and stability of a factory Jeep Fire Engine. 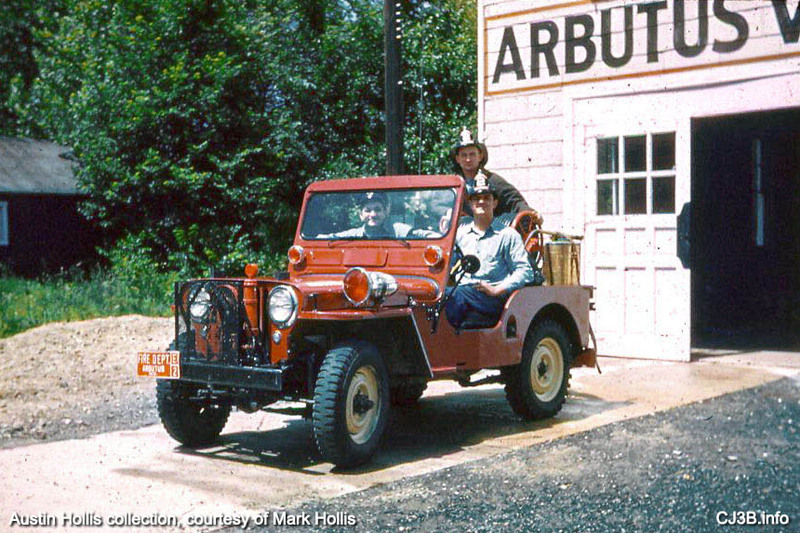 Meanwhile, the Arbutus VFD west of the City went a lower-budget route; in 1951 they purchased a used Willys Jeep and converted it for brushfire use. 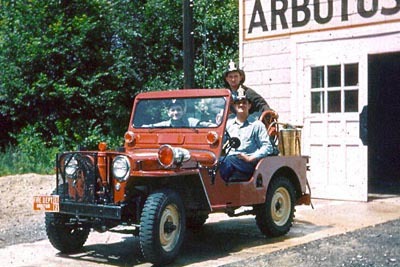 The Arbutus VFD history records the Jeep as a 1947 Willys, but the CJ-3A seen here would actually have been a 1949 model or later. 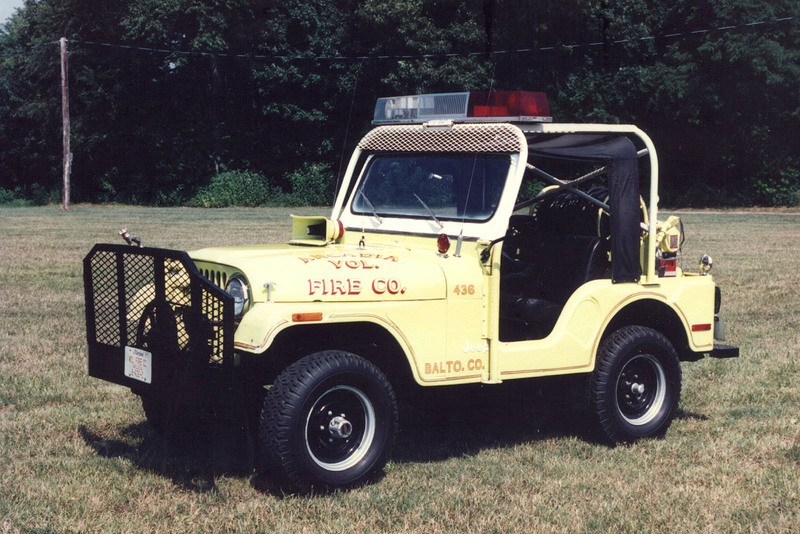 The Jeep's setup is similar to the CJ-3Bs converted by the Baltimore County FD starting in 1955, but it's hard to be sure who came up with the design first, since this photo was taken circa 1957 by Austin Hollis (and is courtesy of Mark Hollis). Anyway, it must have worked pretty well, because the configuration soon became widely used across the county. 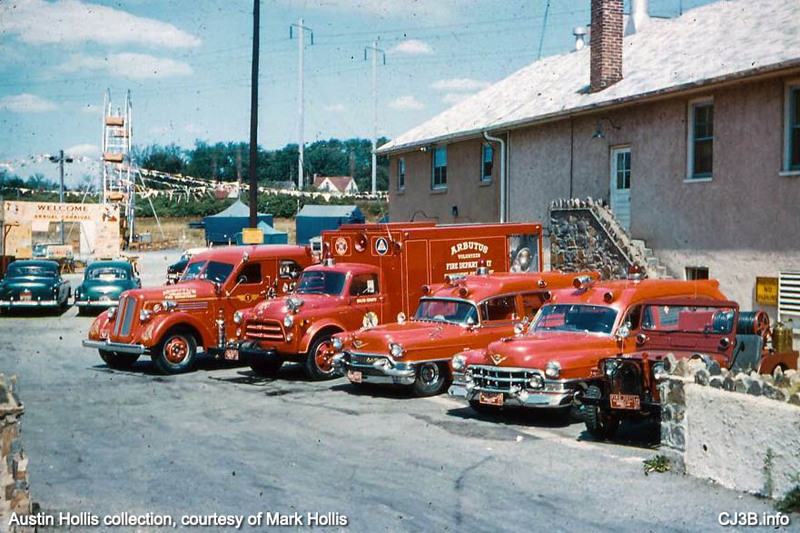 Another Austin Hollis photo from about 1957 shows the Willys as part of a very capable Arbutus roster including a couple of late-model Cadillac ambulances, a 1954 Dodge heavy rescue truck, and a 1947 Seagrave extended-cab pumper. 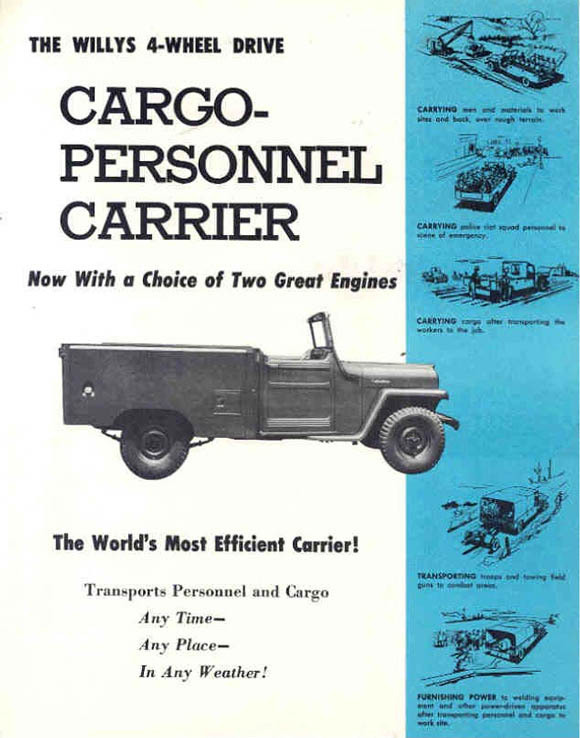 The Jeep appears to be a Willys factory color, possibly Luzon Red. Arbutus is in the southwest corner of the county, and this map also shows some of the other Jeeps which appeared later at volunteer fire companies spread out from the shores of Chesapeake Bay to the Pennsylvania state line on the north side. 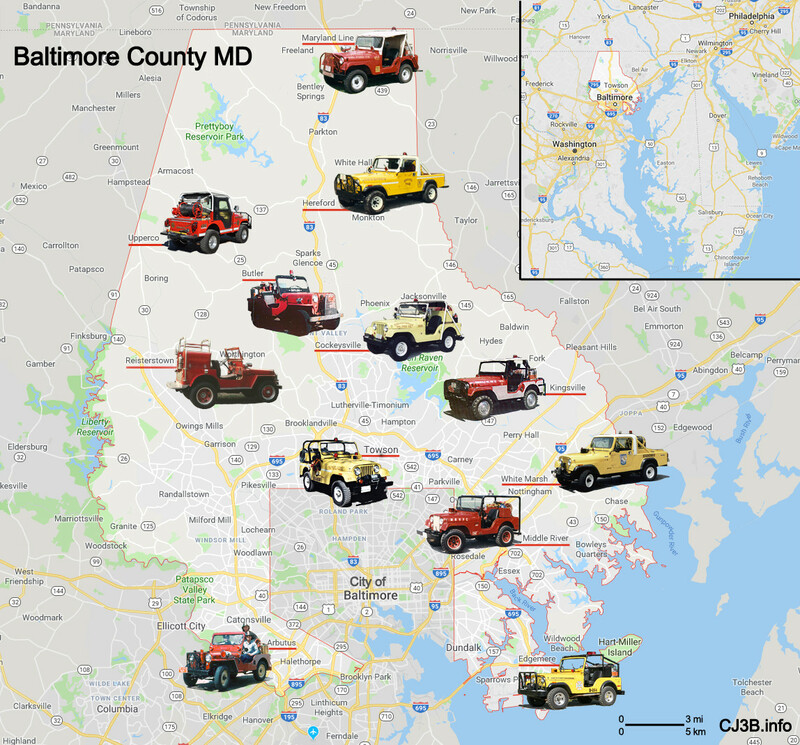 In the middle, just north of the City of Baltimore, one of the Jeeps of the full-time, paid Baltimore County Fire Department is shown at Towson, the county seat. 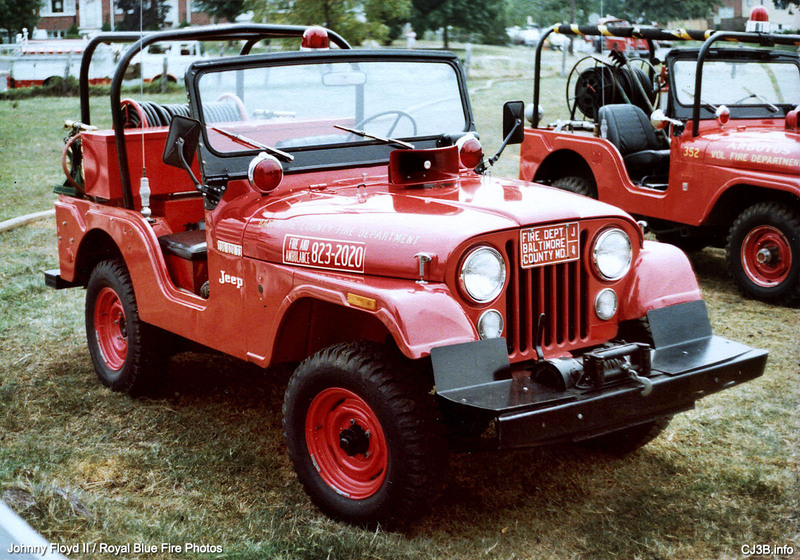 Back when I was working on Part 1 of this article, covering the County Fire Department, I noticed another CJ-5 in the background of this photo by Johnny Floyd II of BCoFD's Jeep 4, a 1973 CJ-5. 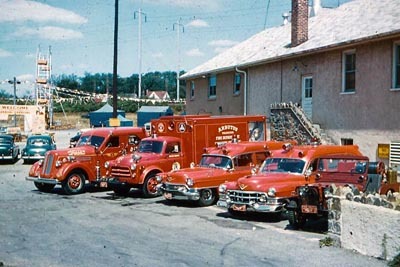 The 1967 CJ-5 in the background is lettered for the Arbutus VFD, Station 35. 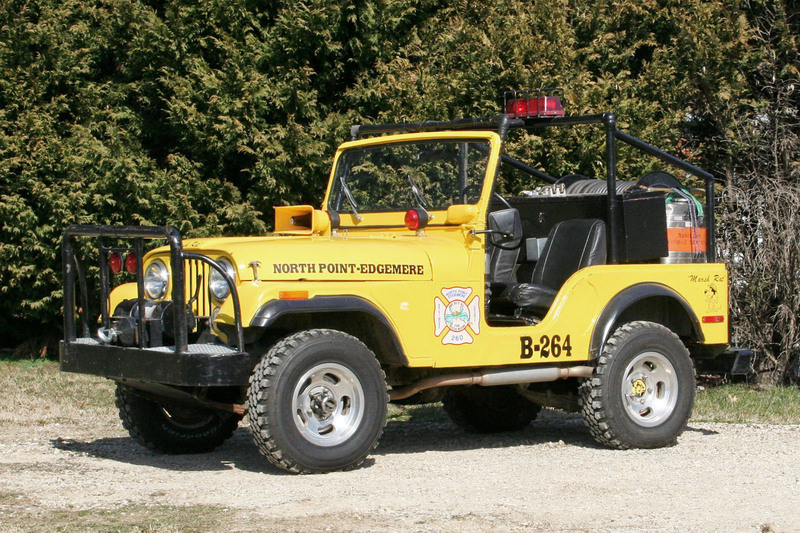 It was the first volunteer Jeep I ran across, but I quickly realized their Brush 352 was one of many Jeeps operated by the volunteer companies in the county. I soon discovered the two earlier flatfenders at Arbutus and Bowley's Quarters, and the Bowley's Quarters VFD History also revealed that "In 1964 a Jeep C14 Brush Unit, for field and brush fires, was purchased. This unit was later sold to Galloway Creek Marina." 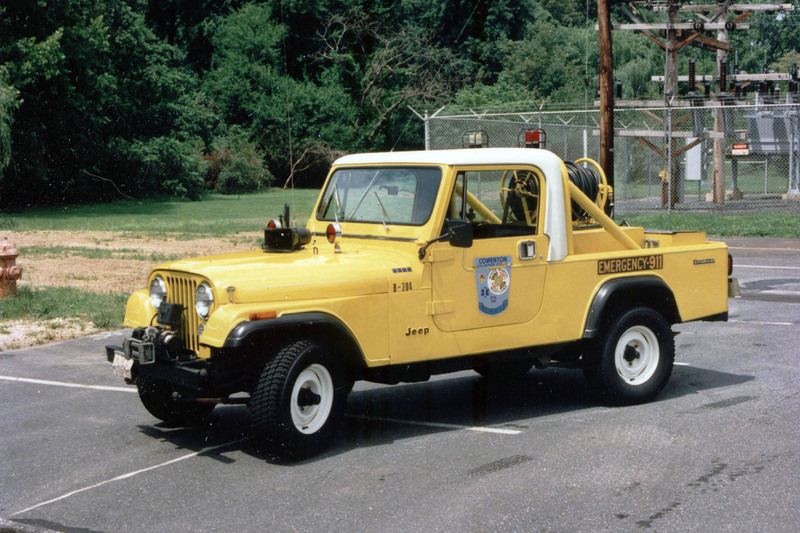 The CJ-5 (right) has similarities to the BCoFD units, but with the practical addition of a steel hardtop to make plowing snow more pleasant. I'm not sure where the "C14" designation came from. 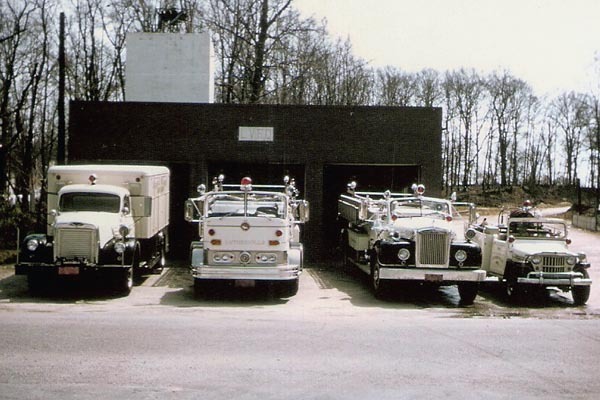 Acccording to my research so far, the first station in Baltimore County to field a CJ-3B with a pulley-driven front pump, cowl-mounted flashers, and rear booster reel, was Station 44 at Hereford. 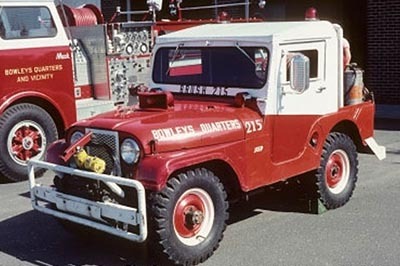 The County Fire Department would soon build about a dozen of what I call the "Baltimore County Willys" design, as seen in Part 1 of this article. But again, it's not clear who exactly came up with this design. 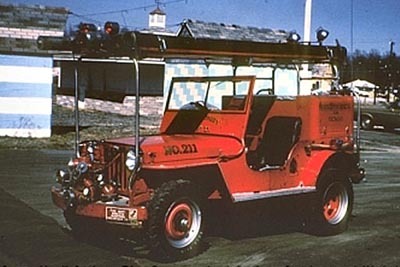 The CJ-3B that became Brush Unit 443 was acquired in 1954. The Hereford VFC History records the following: "It was valuable in fighting woods and field fires. It was also dangerous to drive in steep terrain. In 1965 Firefighter Robert Thomas was killed when the Jeep rolled during a woods fire. This tragic event would lead to improvements in Brush Unit safety." 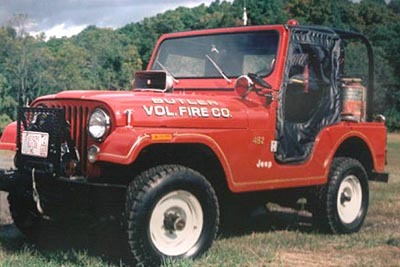 This disastrous incident was also likely a factor in the County Fire Department's decision to put roll cages on all their Jeeps in the early 1970s. 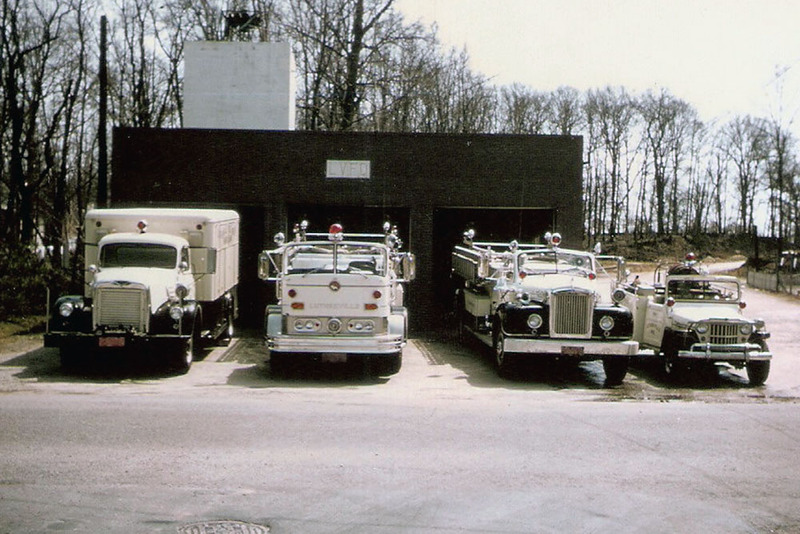 The same pump and tank, and apparently the same brush guard, were used on Hereford's third Brush 443 in 1983. 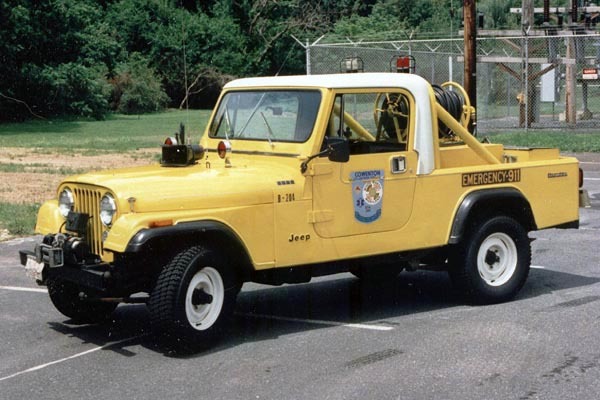 This CJ-8 Jeep Scrambler was in use until its replacement by a Ford F250 in 2001. Photo courtesy U.S. Fire-Police. 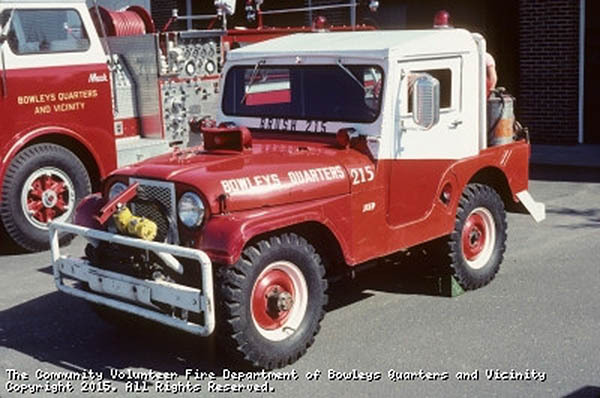 I often wonder why more long-wheelbase Jeeps were not turned into fire apparatus in North America. The greater space for gear seems like a bonus, but possibly was outweighed by the advantage of a compact wheelbase for storage and maneuverability. 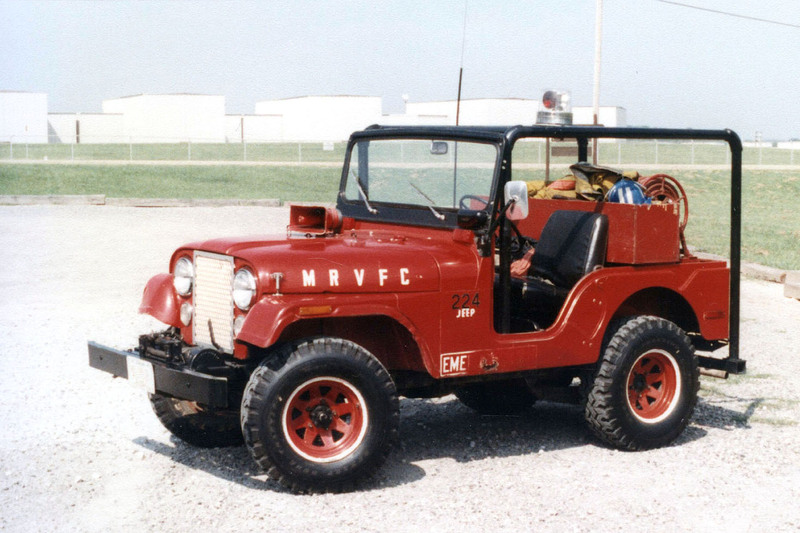 Cowenton VFC (which became White Marsh VFC after 2003) also had a 1983 Scrambler, as Brush 204. It was in a similar yellow with white top, and it's quite possible that the two units occasionally worked together on a big fire at somewhere like the Loch Raven Reservoir. Warren Gleitsman comments that "Ya'll come" brush fires are not that common in Baltimore County, but they do occur every so often. Another early adopter of the "Baltimore County Willys" design was Station 49 in Butler. 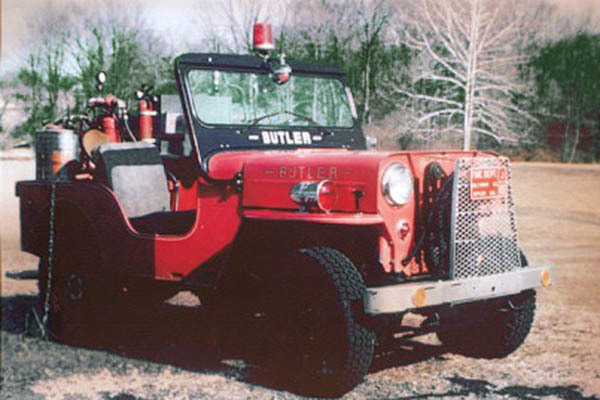 According to the History of Butler Volunteer Fire Company, one of the first purchases by that company after its founding was a 1954 CJ-3B, bought in July 1956. 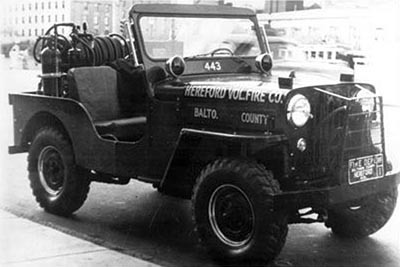 This photo of their Jeep shows it to be almost identical to the 3Bs built by the BCoFD's shops, with a pulley-driven, front-mounted pump. Butler is another volunteer company which has owned three different Jeeps over the years. 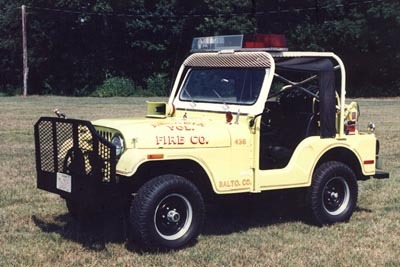 Their Brush 492 was a 1977 CJ-5, again equipped very much as a "Baltimore County Willys". 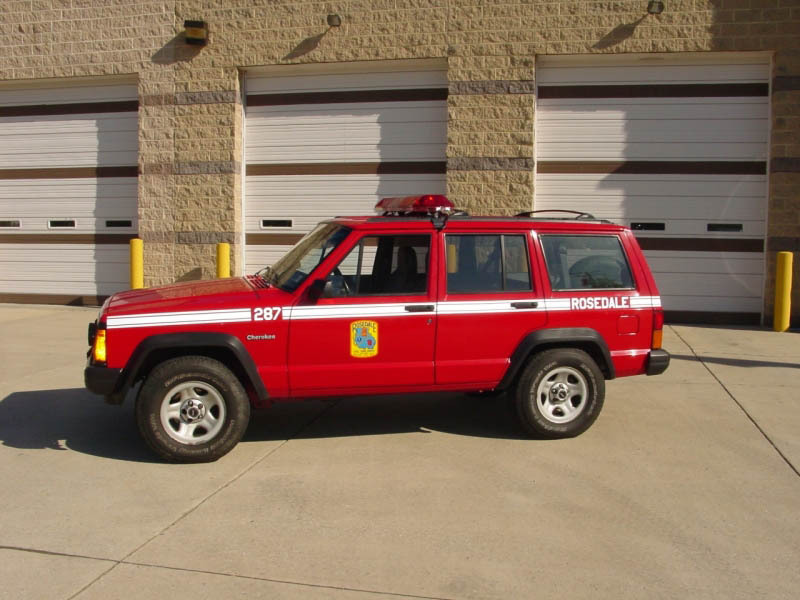 As far as I have been able to determine, this is the only Jeep still in service in the county as of early 2019. 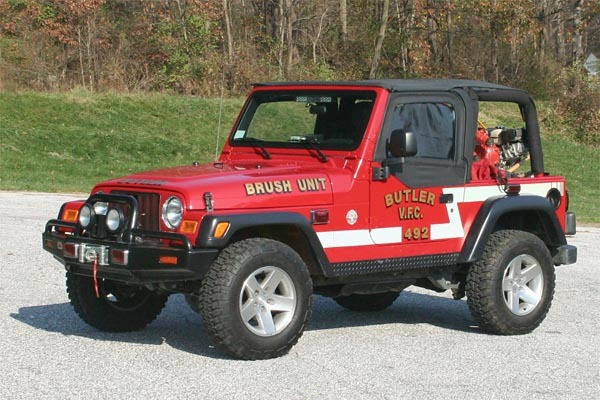 Butler VFC's latest Brush Unit 492 is a 2003 TJ with a Honda pump and a 60-gallon tank. It retains the time-proven Baltimore County big booster reel. Thanks to Hungrybus and MarylandFireTrucks.com for the 2009 photo. Toward the end of its twenty years of service it was given some diamond plate on the body, and it was replaced by a Dodge pickup in 1985. Photo courtesy U.S. Fire-Police. 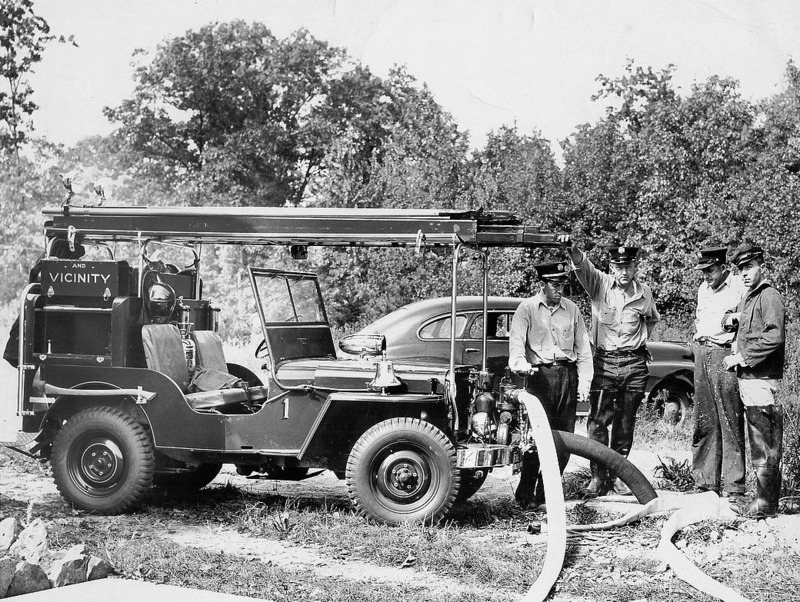 Another Jeep with a pulley-driven front pump, belonged to Maryland Line VFC at the north end of the County. 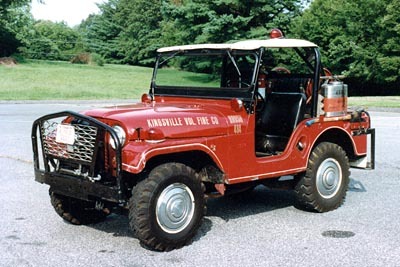 Their Brush 453 was a 1969 CJ-5 donated by the Ladies Auxiliary. Clearly this design was still considered quite functional, long after the County Department had started putting their pumps inside the Jeeps. 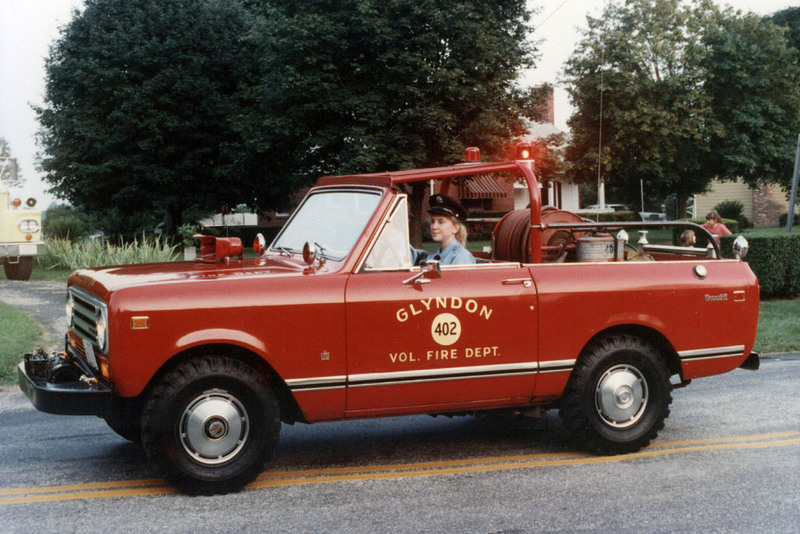 Maryland Line replaced Brush 453 with a GMC pickup in 1986. Photo courtesy U.S. Fire-Police. Arcadia VFC (formed in 1912) went through white, yellow, and red paint schemes before merging with Boring VFC in 2017 to form the Upperco VFC, which has adopted a blue and white livery! Brush 436 repainted in red is seen in this photo by Mike Sanders. In June 2018 the new Upperco VFC was awarded the trophy for the company with best overall appearance, at the annual Maryland State Firemen's Convention -- the first time this award went to a Baltimore County company. Honorable Mention for Apparatus Over 25 Years Old, Out of Service, went to Brush 436, seen here at the convention. Photo courtesy Upperco VFC. 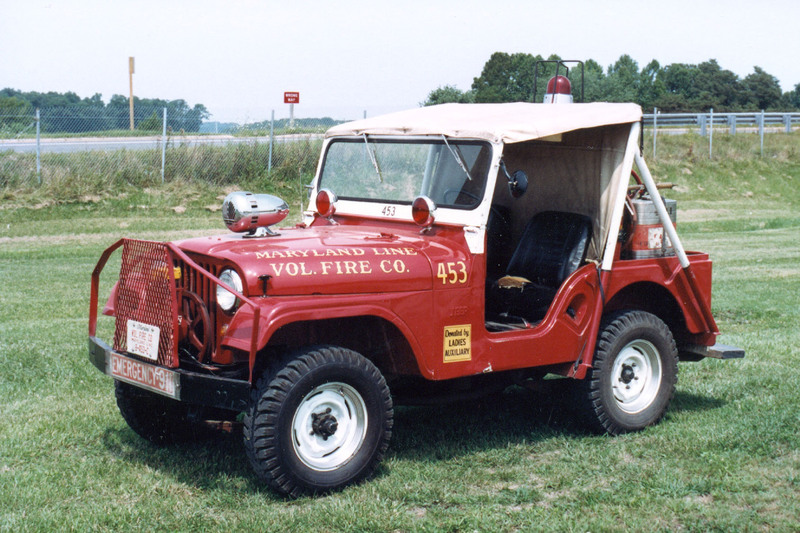 In the background of the above photo is a 1990 YJ owned by the Huntingtown VFD, in nearby Calvert County MD. 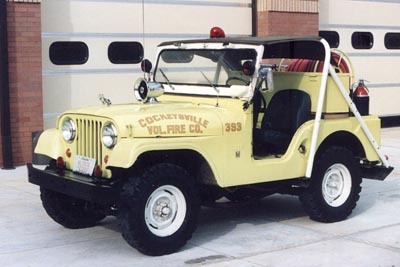 (See more on this Jeep in Fire Service Jeep Wranglers on CJ3B.info.) 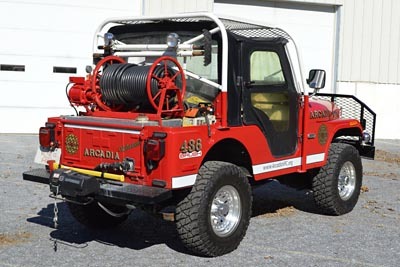 The Huntington YJ is a reminder that the enthusiasm for Jeeps did not end abruptly at the county line; I have run across quite a few other fire departments in Maryland and New Jersey who also owned or currently own brushfire Jeeps. 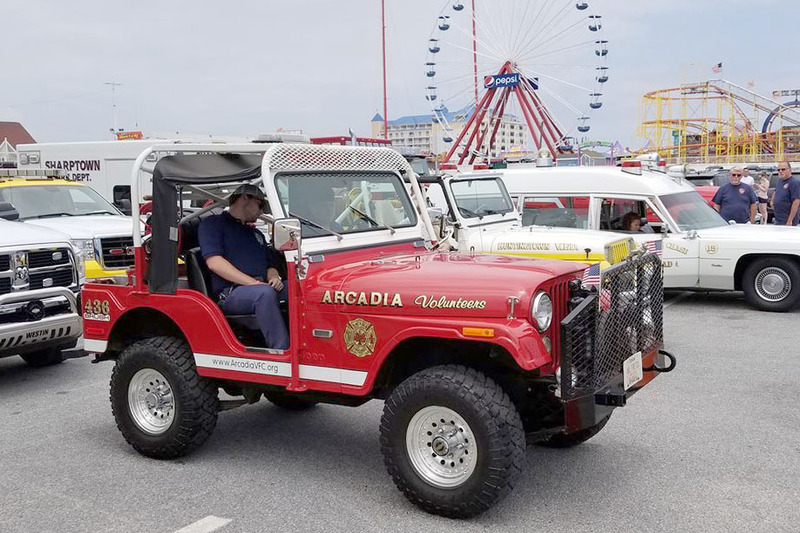 Another Jeep with a Mack bulldog on the front was Brush 393 at Cockeysville, a 1968 CJ-5 which may have had the under-hood Panama pump used by the BCoFD's CJ-5s. It had a fairly short career before being succeeded by a 1977 Dodge pickup. Photo courtesy U.S. Fire-Police. 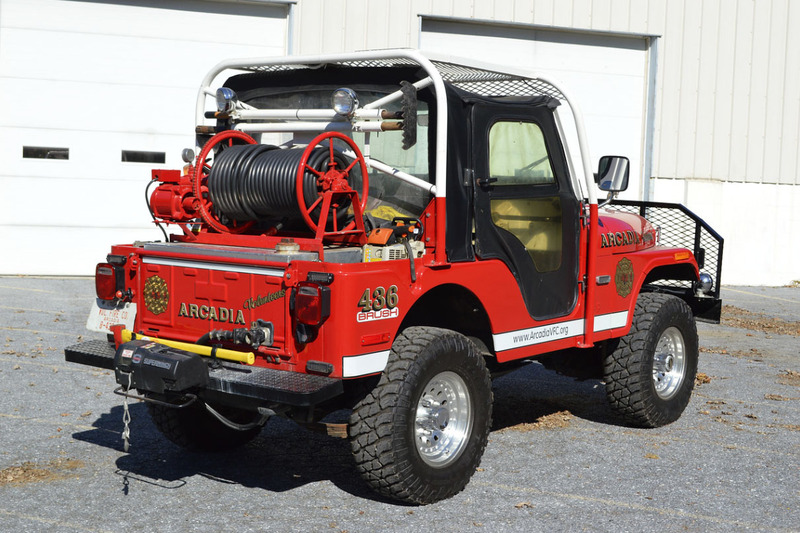 Middle River Volunteer Fire Company also had a 60s CJ-5 with an undercover pump, as their Brush 224. (Note: MRVFC at Station 22 merged in 2016 with Ambulance Rescue Station 52, to form Middle River Volunteer Fire & Rescue Company 74. And they are not to be confused with BCoFD's Station 12, also in Middle River!) Photo courtesy U.S. Fire-Police. 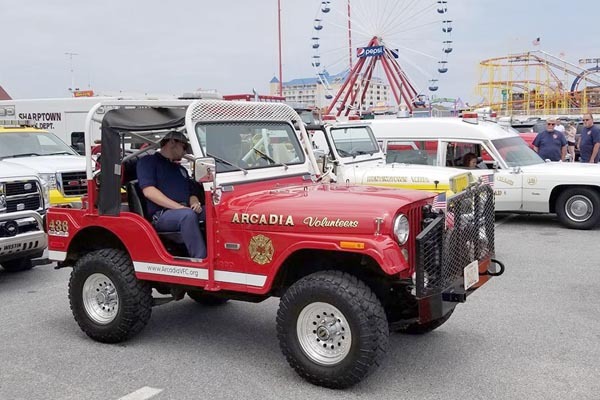 MRVFC also went briefly to a 1978 Dodge pickup as their Brush 224, but then redesignated the truck as Utility 22, and replaced it with a 1981 CJ-5. Once again, the setup was similar but with the equipment locker on the rear step. Photo courtesy U.S. Fire-Police. 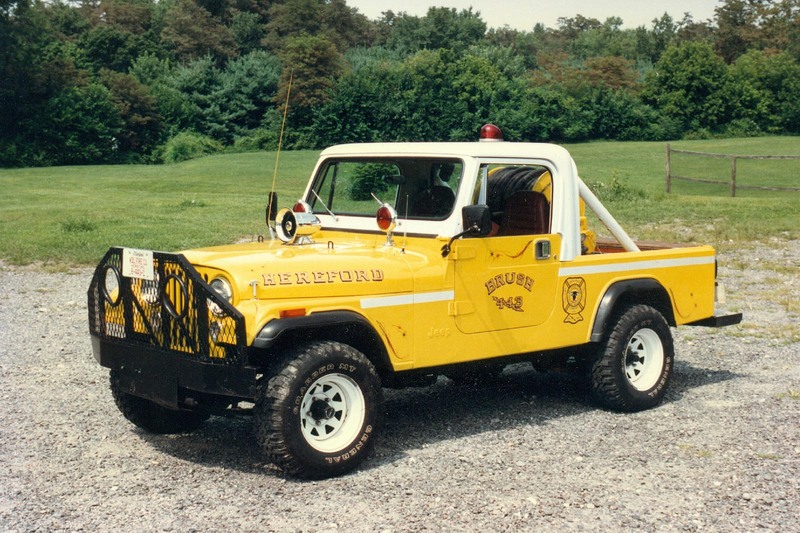 Jeeps with similar setups continued to appear in the 1970s, and some of the volunteer companies also made the same switch to yellow apparatus as the BCoFD. 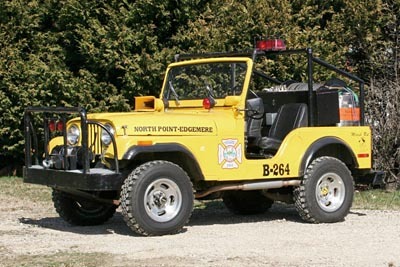 The North Point-Edgemere Volunteer Fire Department at Station 26 ran this 1975 CJ-5. Photo by Tim Wolfe. 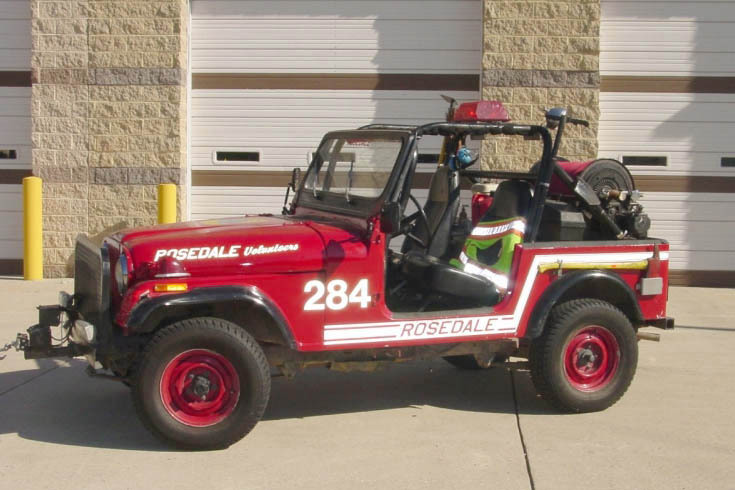 Rosedale Volunteer Fire Company had the only CJ-7 I have run across in the county, as their Brush 284. It has been replaced by Brush 286, a Ford F350, and their website says, "After many years of faithful service, 284 will find a new home to play and do Jeep things." 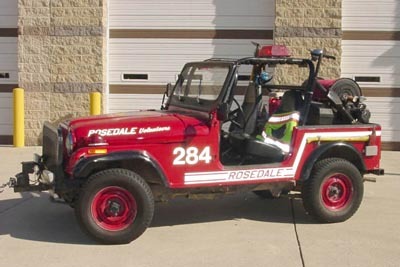 Rosedale also used an XJ Cherokee as Utility 287 (80K JPEG). 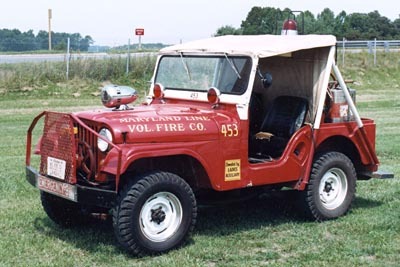 A footnote to the story of the Baltimore County volunteer Jeeps, is a handful of Willys and Kaiser Jeep trucks. 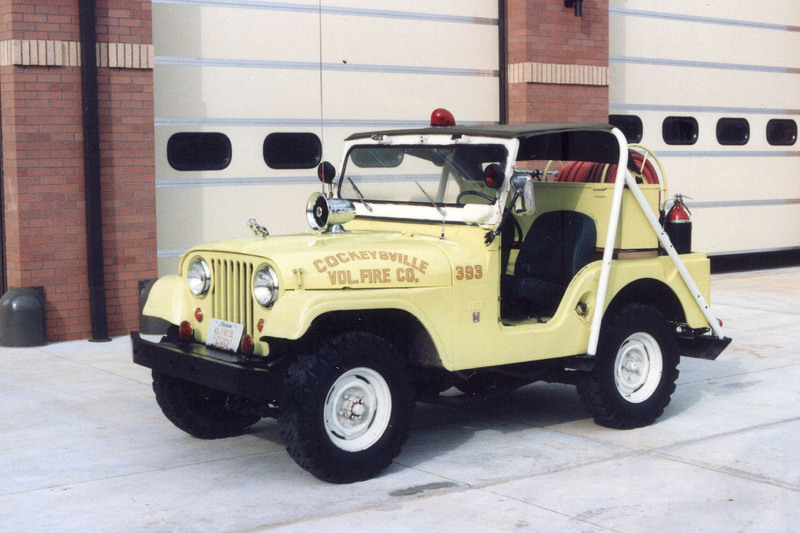 Lutherville VFC Brush 304 was an unusual and beautiful little pumper built by Oren Roanoke in Virginia, on a 1956 Willys 6-226 Cargo-Personnel Carrier. 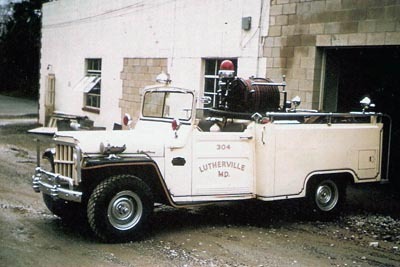 Lutherville bought it from Reisterstown VFD, who replaced it with a Dodge Power Wagon as their brush unit. 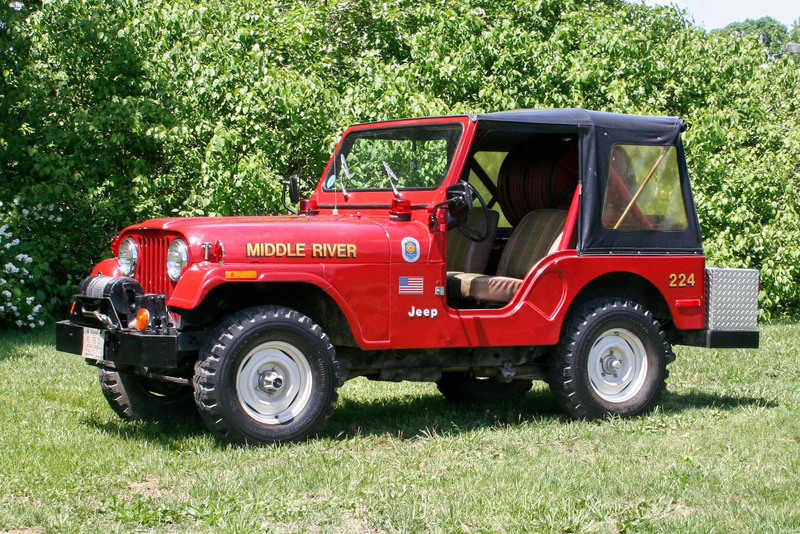 The Willys was sold in 1981 to a private school in Brooklandville, and reportedly ended up in Canada. Photo courtesy Jim Fairweather. 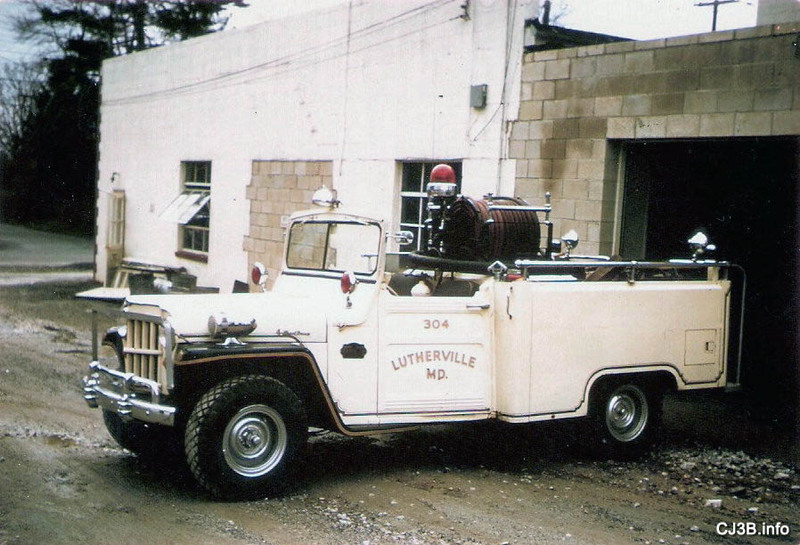 Lutherville liked open cab apparatus! 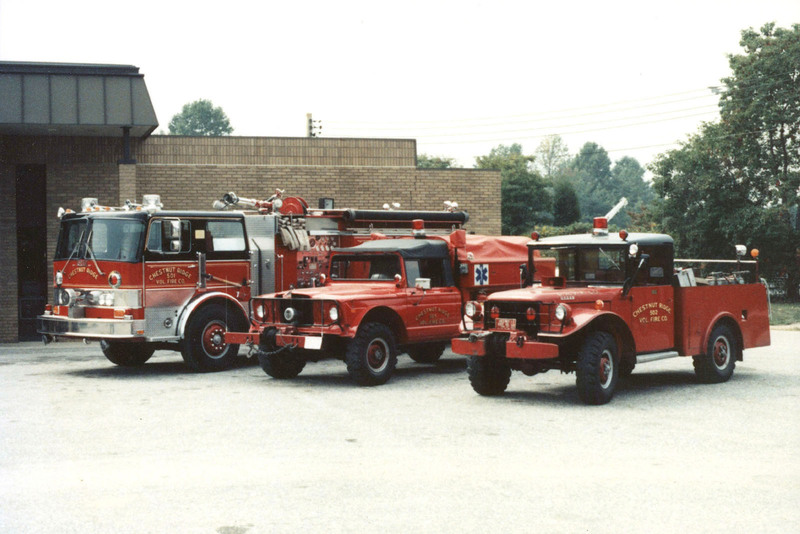 This 1963 photo courtesy U.S. Fire-Police shows their Oren-Willys beside Engine 309, a 1954 Mack which served from 1954 to 1963, was sold to North Carolina, and in 1990 re-acquired and restored. Engine 301 is a 1962 Mack bought from the BCoFD, and Emergency Squad 303 is a 1958 International. 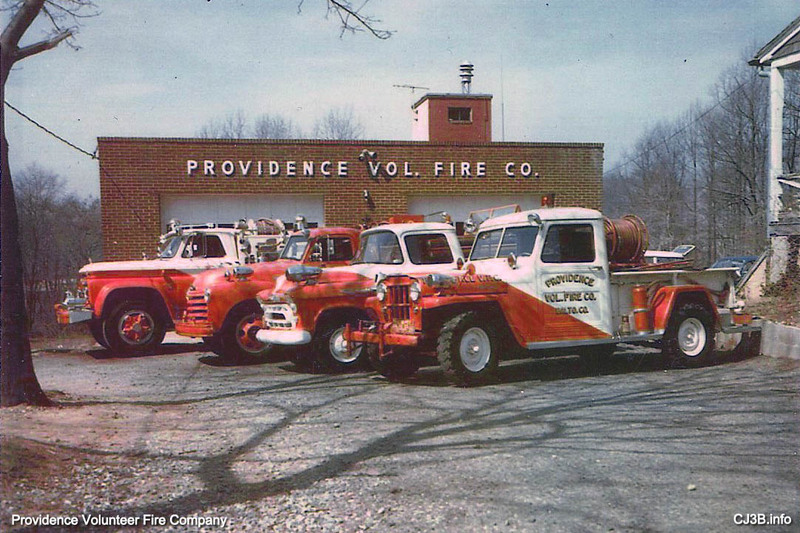 Providence VFC, located near the large Loch Raven Reservoir nature preserve, is seen here in the mid-1960s. 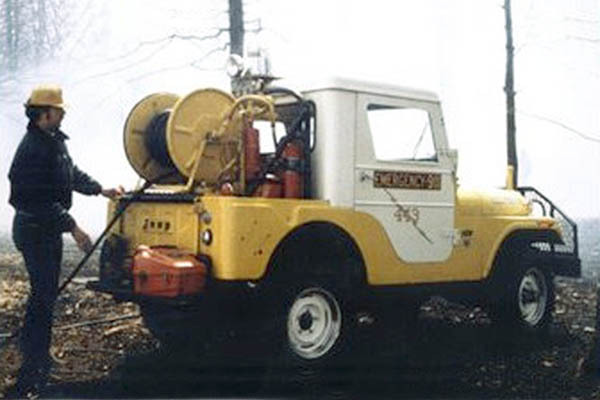 They had taken a slightly different approach from other companies, when they purchased a Willys Jeep pickup truck (foreground) in 1958 and equipped it for fighting brush fires. It was the first vehicle to be painted in the distinctive diagonal white-over-red livery still used by Providence. 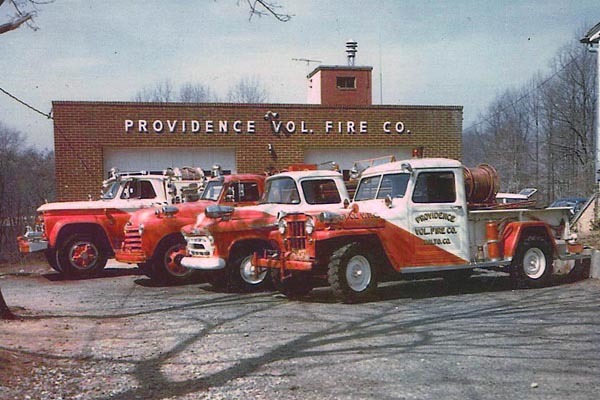 (Providence VFC History) Before long it was supplemented by a 1964 4x4 Chevrolet/Howe (rear). 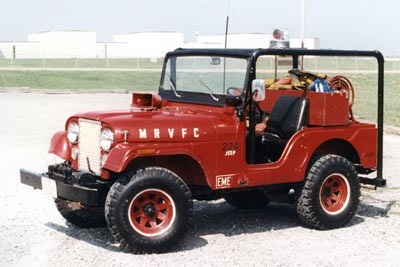 Like the County Fire Department, Chestnut Ridge VFC at Station 50 used a Kaiser Jeep M715 as Special Unit 504, carrying hose. According to Warren Gleitsmann, "Their district has a lot of large homes, and they used the hose to lay lines up driveways or from the driveways to the rear of the homes." SU504 also ran medic assist calls such as motor vehicle accidents, and was in service until 1988. 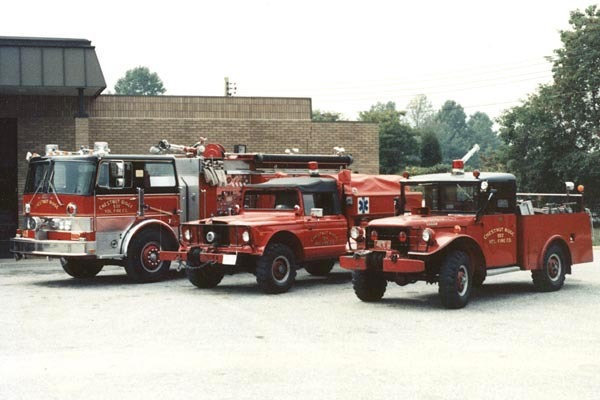 The M715 is seen above in the 1980s with Brush 502, a 1953 Dodge M37 converted by Maurice L. Long & Son Body Shop of Brooklandville MD in 1962, and still owned by Chestnut Ridge as of 2019. 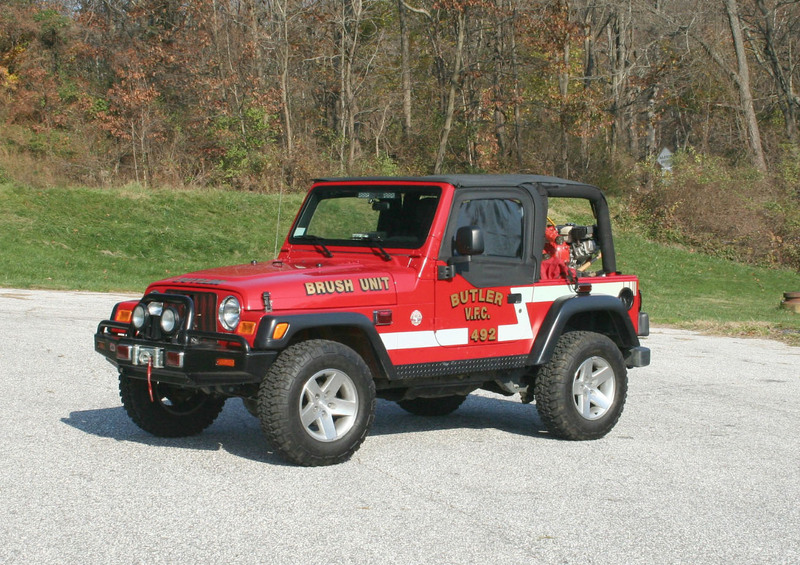 See also Part 1: Jeeps of the Baltimore County Fire Department.